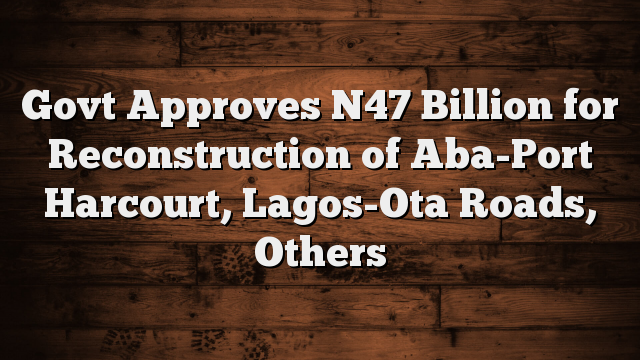 The federal government Wednesday in Abuja approved contracts for three road projects at the total rate of N47 billion including the redesign and reconstruction of Aba-Port Harcourt road. Briefing journalists at the end of seven-hour Federal Executive Council (FEC) meeting in the State House presided over by Vice-President Yemi Osinbajo, the Minister of Power, Works and Housing, Mr. Babatunde Fashola, said the contract for Aba-Port Harcourt road portion of the Enugu – Port Harcourt road would cost N6.3 billion. He also said FEC approved N22 billion for the reconstruction of 81-kilometre Lagos-Ota-Abeokuta Expressway and another N19.392 billion for the repair of 44.625-kilometre Baban-Lamba-Sharam road in Plateau State. “The Ministry of Power, Works and Housing got approval for three memoranda. One was for Baban Lamba-Sharam road in Plateau State for the construction of 44.625 kilometres road for N19.392 billion. The second was for Lagos-Ota-Abeokuta Road – 81 kilometers. That road was first awarded in 2000 and it has since been left uncompleted because there was no budgetary provisions for it. “This administration, in trying to move these contractors to site, started the revision of the rate. So, the revised rates were brought to council today (yesterday) and a revision of N22 billion was approved for the 81 kilometers road, bringing the total contract price to N56.701 billion. “The third approval was for section four of the Enugu – Port Harcourt road, the part between Abia and Port Harcourt, particularly in Port Harcourt that has been problematic and has failed severally. We have a contractor there but we need to change the design because of the storm water drainage needs and the high water tables there so that the road does not fail. So, that requires a revision of the scope of work to include retaining side lanes and drainage facilities in the sum of N6.309 billion,” he said. Also briefing, the Minister of Transportation, Rotimi Amaechi, announced that the council also approved N13 billion for the dredging and refurbishment of navigational facilities of Warri seaport in Delta State. The Managing Director of Nigerian Ports Authorities (NPA), Mrs. Hadiza Bala Usman, who led senior officials of the organisation to FEC meeting to defend the project, also told journalists that the dredging of escravos channel of the seaport would improve the effectiveness of Warri port and equally expand the utilisation of eastern seaports. She also said the plan by NPA towards the dredging of Calabar port had got to an advanced stage, disclosing that previous contracts were terminated for violating relevant procurement processes. While the Minister of Education, Adamu Adamu, said FEC also approved the establishment of the Nigerian Army University in Biu, Borno State, with courses of study to be spelt out and accredited by the National Universities’ Commission (NUC), his counterpart in the Ministry of Interior, Abdurahman Danbazzau, stated that FEC also approved the upgrading of infrastructure at the Nigeria Police Academy, Kano, at the cost of N234 million. In the same vein, Water Resources Minister, Suleiman Adamu, said regressing urban water supply was hampering Nigeria’s attainment of millennium development goals (MDGs), resulting in FEC approval of the declaration of emergency in water and sanitation sector as well as increased funding for the sector, following an action plan submitted for consideration by the ministry.